All natural handcrafted rubber over insulating neoprene. 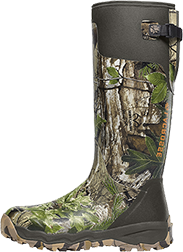 Uncompromising fit, scent free and waterproof protection. Contoured ankle fit design to prevent heel slippage. Adjustable back gusset and strap with adjustable fit for various leg sizes. Bi-directional embossed neoprene liner for increased inner air circulation. Burly Pro outsole featuring superior traction and stability with no mud buildup.